Plan to attend the 12th annual Andersonville Arts Weekend from Friday, October 10th to Sunday, October 12th, 2014 in the general vicinity of Clark and Foster. Get your creative juices flowing by celebrating Andersonville’s artistic community and fabulous array of locally-owned businesses. Features original artwork by dozens of local artists and designers showcased in businesses throughout the neighborhood, plus a variety of live shows and performances. For the 12th year, Andersonville is thrilled to celebrate many of the artists and designers who live and work in the neighborhood with Andersonville Arts and Design Weekend. We hope you will take the time to explore the dozens of artists on display in many of your favorite Andersonville businesses. Friday night will kick off with the always popular Night of 100 pARTies!, an evening of receptions up and down Clark Street. Visit the Andersonville Arts and Design Weekend website! On Friday night, there will be parties throughout the neighborhood. The event will feature original artwork by many local artists. On Saturday and Sunday, Andersonville businesses are hosting visual and performing artists. 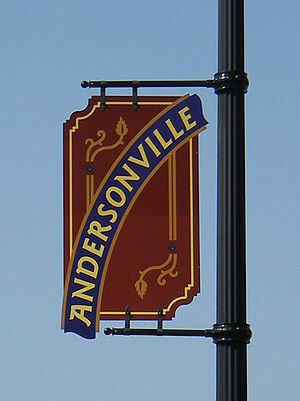 Pick up an “Art Walk Brochure” and enjoy charming and Historic Andersonville in Chicago. In the 1850, the area north of Foster and east of Clark Street was a large cherry orchard. After the Chicago fire of 1871, wooden houses were outlawed in the city of Chicago. The Swedish immigrants who couldn’t afford to build homes of brick or stone, began to settle in this area outside the city’s northern boundaries. Swedish Americans are Americans of Swedish descent, especially the descendants of about 1.2 million immigrants from Sweden during 1885-1915. Here’s an Andersonville Video showcasing the neighborhood highlights http://youtu.be/-kdsehoFM6M. Today, 2nd and 3rd generation Swedes live in harmony with the diverse ethnic Korean and Lebanese inhabitants. In the late 1980’s, a large creative, gay population came in and started renovating the beautiful grey stone buildings in Andersonville. Dr. EveAnn Lovero writes Travel Guides @ www.vino-con-vista.com. For more information about Andersonville Arts Weekend visit www.andersonville.org/artsweekend. Which Chicago Neighborhoods Have Been Most Changed By Gentrification?